The Wind and Thermal Shield sitting atop InSight’s seismometer. Since NASA’s stationary InSight lander made it to Mars on December 19, mission controllers have been steadily deploying its various instruments. During the past several weeks, the team has been adjusting the Seismic Experiment for Interior Structure, otherwise known as SEIS. Earlier today, the space agency issued a release highlighting the latest accomplishment in the mission—the placing of a protective dome-like covering, called the Wind and Thermal Shield, over the Marsquake detector. On Earth, seismometers are buried about four feet underground to protect them from the elements. 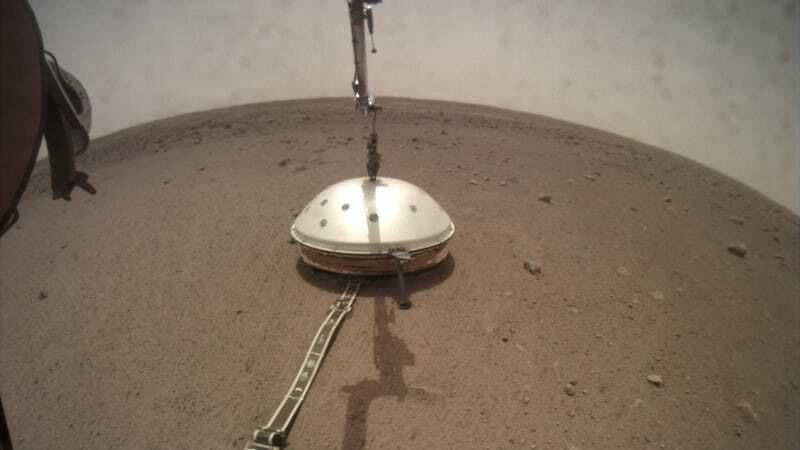 The InSight probe isn’t capable of digging a sufficiently large hole, but it does have a robot arm, which it used to placed the protective covering over SEIS. The shield will now guard against external interference that could get in the way of accurate data collection, such as wildly fluctuating temperatures and high winds. The dome is designed such that even a strong gust won’t be able to topple the structure. But while winds are a definite concern, it’s the wild fluctuations in temperature that pose the greatest threat to SEIS. From night to day, temperatures on Mars can swing 170 degrees Fahrenheit, or 94 degrees Celsius. The sphere is enclosed within yet another insulating container—a copper-colored hexagonal box visible during SEIS’s deployment. The walls of this box are honeycombed with cells that trap air and keep it from moving. Mars provides an excellent gas for this insulation: Its thin atmosphere is primarily composed of carbon dioxide, which at low pressure is especially slow to conduct heat. So far, this remarkable mission has gone off without a hitch. Fingers are crossed it stays that way.